This recipe for small-batch brownies makes just ten average-sized brownies, making them perfect for those times you’d like to indulge in moderation. These brownies are fudgy and feature the classic shiny, crackly tops – all with being made in one bowl. Heat oven to 350 degrees F. Line the bottom and two sides of a 9"x5" loaf pan with parchment paper and lightly spray with cooking spray. In a medium-large microwave-safe bowl, add butter and 1/2 cup of the chocolate chips and melt in 20-second intervals on medium power until mixture is melted and smooth, whisking after each interval. Once melted, whisk in sugar, egg, and vanilla extract until combined. Add flour, espresso powder, and salt and whisk until well-combined. You want the batter to have a slight "shine" to it. Stir in remaining 1/4 cup of chocolate chips. 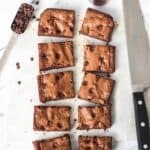 Pour brownie batter into the prepared loaf pan and bake for 30-40 minutes, or until the edges have set and a tester (like a toothpick) inserted into the center of the brownies comes out just about clean, with only a few crumbs clinging to it. Let brownies cool completely before slicing. Lift the brownies by the overhanging sides of the parchment paper and cut into slices, once cool. I used a mixture of semisweet and dark chocolate chips as that's what I had on hand (probably about half of each). You can use all semisweet if you prefer.